Harrogate Town stay third in the National League following Saturday's 2-0 success at Ebbsfleet United. 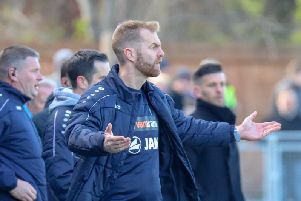 Here's an assessment of how Simon Weaver's players performed in the pouring rain on their way to a fourth consecutive away triumph. James Belshaw 7. Not one of his busiest afternoons, but coped with the rain and wind well. Warren Burrell 8. Always made himself available for a pass at right-back and made good use of possession when it did arrive. Callum Howe 8. Claimed his fifth goal of the season with a typical back-post header and didn’t allow Ebbsfleet a sight of goal. Kelvin Langmead 8. Another assured performance next to Howe, put his body on the line and won everything that came his way. Liam Kitching 7. Had to contend with a lot of attacks down his side of the pitch, but dealt with them competently and got forward to good effect, too. George Thomson 7. A nicely-weighted pass to Aaron Williams to create Town’s second and tidy throughout. Josh Falkingham 9. ADVERTISER MAN OF THE MATCH. Controlled the game from the outset with strong challenges and dictated the tempo with slick passing. Jack Emmett 8. Picked up where he left off at Boreham Wood with the hosts unable to get anywhere near him and resorting to fouls on multiple occasions. Joe Leesley 8. An excellent performance on the left of midfield. Delivered quality crosses into the box, including an assist for Howe’s opener. Aaron Williams 7. An excellent finish to effectively seal the win, looks to be growing in confidence with every start. Jack Muldoon 7. Worked hard up top as usual, chasing every ball and not giving Ebbsfleet defenders a moment's peace. Substitutes: Mark Beck 7. (On for Muldoon, 67). Made a nuisance of himself in the time he was on the pitch. Liam Agnew N/A. (On for Emmett, 87).